(meaning to harvest) together with energy, which creates “to harvest energy”, or "Gleanergy"! As sensor nodes become ubiquitous, the need to power wireless sensor nodes from ambient energy sources will be a necessity. Possible ambient energy sources include light, heat, vibration, stress / strain, high intensity AC magnetic fields and micro-sized rotational or oscillatory electromagnetic generators. In many instances a battery will be required to “ride through” the periods of time when the ambient energy source is either not present or not sufficient to power the sensor. 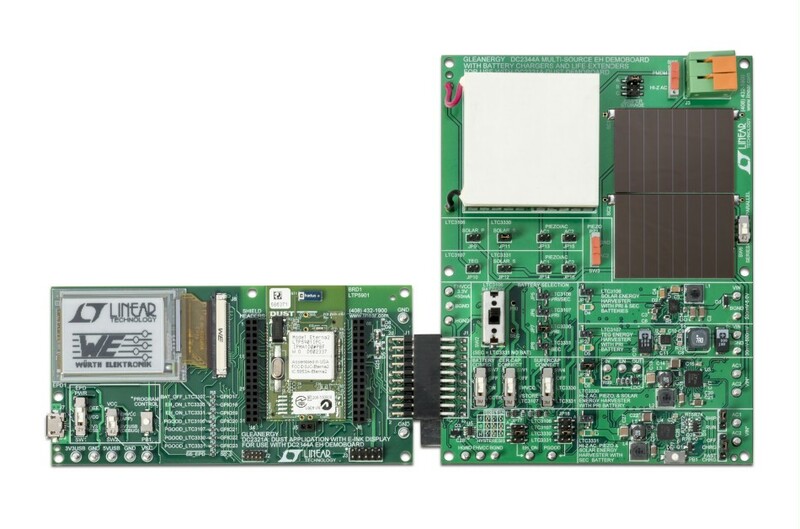 This development platform demonstrates the ability to utilize any one or multiple ambient energy sources to power a wireless sensor node and extend the life of a primary or secondary battery. A convenient system is provided to enable users to customize the development platform for their specific use case and make a complete working prototype. Shield board headers DC2510A and programming headers for development ( AppNote is available here). On-board thermoelectric generator and solar cells (series or parallel) in DC2344 ( AppNote is available here). 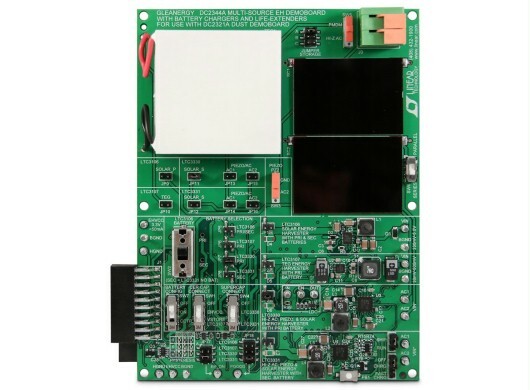 Use regulated output supply to power DC2321A or any load ( AppNote is available here). Analog Devices is supporting our Gleanergy Demokit as well. Click here to watch the video. Looking for a piezoelectric source to work with Gleanergy? Mide Engineering Solutions piezoelectric energy harvester (VLT-9001) is capable of harvesting tens of mW of continuous power. The Demokit includes a two layer protected piezoelectric energy harvester, plus hardware for clamping and adding included tuning masses.